Industry 4.0, or Industrie 4.0, is a movement that has great impact on the world of industrial automation. It is about software. And so is PLCopen. Basically Industry 4.0 consists of two main items: the RAMI model and the Asset Administration Shell. In the RAMI model the standard PLCopen functionalities fit very well and so PLCopen focuses on the Asset Administration Shell, AAS. And in this shell PLCopen adds their functionalities also. PLCopen has already defined many software functionalities via the definition of Function Block Libraries, like done for Motion Control, Safety, and for Communication over OPC UA. These PLCopen specifications provide a well-defined suite of functionalities, covering the basic range. In addition there is a framework defined by PLCopen related to the definition of function blocks with a focus to the definition of user specific libraries. With this one can encapsulate larger functionalities which are linked to the higher levels of integration. This helps to do the engineering of a new machine more easily and to provide a more decomposed and reusable structure in the software development, making it easier to add new wishes. In order to be able to access these functionalities in AAS and make it available to the application running on the controller, PLCopen is defining a set of Function Blocks. In this way the programmer can access the relevant information in a harmonized way. Additionally PLCopen is working on a document showing the integration of PLCopen, PackML and OPC UA technologies. Following some basic rules for the application development, it will become much easier to interface to a machine in a harmonized way and to integrate machines in production lines in a standardized way. With the combination of the OPC Functionality for browsing, one can even search for new functionalities and add them as the basis for a new application program. During the SPS IPC drives PLCopen will show the status of this new development. PLCopen is working on a document showing a PackML sub model example for the I4.0 Asset Administration Shell technologies. A real challenge of the next digital revolution is the convergence of IT (Information technology) and OT (operation technologies). This means that IT, or more precisely the ICTs (Information Communication Technologies), will link the altostratus levels of Watson, Amazon, SAP, and the likes, directly to the automated production shop floor, an initiative like never before. Some may say that Innovation Technologies will meet the Old Technologies. Backward compatibility, product consistency and reliability requirements can force many automation technology vendors in a conservative attitude in regards to IT. On the other hand, what is the ITC provider’s know-how and background on manufacturing, industrial robotics and factory automation? It is easy to say that a cloud to sensor connection will change the production world, but that might be oversimplifying the engineering skill-set required. Solid bridges must be tended between the two technology worlds. One important new concept for production machines in the digital era is being defined as the AAS, Asset Administration Shell. In the future every asset, machine or high-value component will need to be equipped with an AAS to be “I.4.0 ready”. In case of a machine the AAS, as seen from the cloud should be the main landing page or resource directory listing all services the machine can provide as well as all relevant asset information. In that case traditional but reliable automation practices need to be incorporated in to the AAS. Field proven information models for production automation can be proposed as sub models. One of these models is PackML, which defines the machine operation, a uniform operator Human Machine Interfacing, and provides predefined OEE (Overall Equipment Efficiency) KPIs. A PackML sub model can be proposed as part of the Administration Shell as a machine behavior semantic model. As a proposal of such a sub model PLCopen is working on a paper with the intent to motivate the different stakeholders to consider such an effort. New concepts like AAS combined with implemented automation information models can help bring the IT and OT together, by providing an ample landing bridge. Since the release of the IEC 61131-3 programming standard, users want to be able to exchange their programs, libraries and projects between development environments. Although this was not the intent of the standard itself, it was a task that the independent organization PLCopen committed itself to. IEC 61131-3 defines programming languages. As such it is just a part of a total solution. Other parts are tools for simulation, debugging, version control, documentation, networking and more. PLCopen has decided years ago to realize interfaces towards these supporting tools. This resulted in a workgroup named TC6 for XML (eXtensible Markup Language). This committee defined an open interface which can be used by different kinds of software tools to transfer the information that is on the screen to other platforms. This screen information does not only contain textual information, but also graphical information, like where the function blocks are and how they are connected to each other. In 2014 we entered a new phase for this document. Through the German DKE, PLCopen handed over its intellectual property rights on the schema, specification and documentation to IEC. After successful consultations, an IEC committee started the work to publish the PLCopen XML specification as IEC 61131-10. With the release of the 3rd edition of IEC 61131-3 a major overhaul was needed to include the changes and extensions like object oriented features. This XML exchange format enables a transfer of IEC 61131-3 projects, from an exporting environment to an importing environment, including extensions for layout and formatting. The document defines a solution independent eXtensible Markup Language (XML) based exchange format, to be supported by interfaces of different kinds of software tools. Besides textual and program logic information, it also provides the ability to transfer graphical representation information, e.g. the position and size of function blocks and how they are connected. The design of the ‘transferred’ parts shall represent the same program logic, however it may be altered in look and feel. 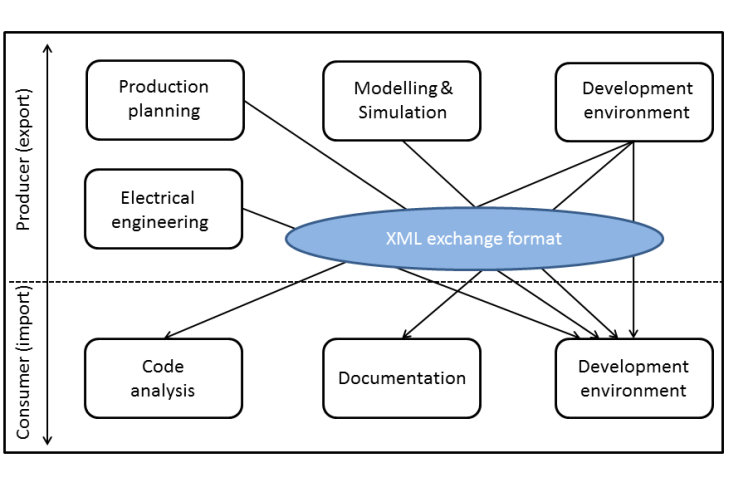 The XML exchange format provides for life cycle management of automation systems, e.g. in case of redesign, maintenance or device replacement. If an IEC 61131-3 project is stored in this standard’s XML exchange format, it could be reused independent of a special development environment. And thus, it could be modified and maintained by any other development environment supporting this standard’s XML exchange format. This new International Standard IEC 61131-10 PLC open XML exchange format was developed based on material from PLCopen. The document extends PLCopen XML, adopts it to the features of IEC 61131-3:2013 and is therefore not compatible to previous versions of the PLCopen XML specifications. The international standard IEC 61131-10 will be published in the beginning of 2019. PLCopen will have a booth at the upcoming SPS IPC Drives which takes place in Nuremberg from November 27-29. SPS IPC Drives is Europe’s leading exhibition for electric automation. Besides up-to-date information there is a demo machine showing the concepts of PLCopen Motion Control Part 4 – Coordinated Motion, especially the functionality tracking where a kinematic model follows a position on a moving belt. Be aware that our position has moved to a new hall: we are now in Hall 5, booth number 340. Or, follow this link for your complimentary entry ticket. PLCopen is sponsoring ARC’s 23rd Annual Industry Forum – “Driving Digital Transformation in Industry and Cities”, which takes place from February 4-7, 2019 in Orlando, Florida, USA. Check their website for more information on this Forum. koenig-pa, based in Germany, provides products and services related to automation systems.